By William Burr and Jeffrey Kimball. 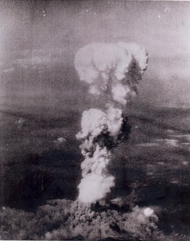 Seventy years ago, in August 1945, the United States destroyed Hiroshima and Nagasaki with atomic weapons. Since then, neither the United States nor any other nuclear-armed country has used such weapons against an adversary. Why not? During the Cold War, Washington and Moscow made nuclear threats that could have led to catastrophe, and the history of US strategy and policy since 1945 includes many examples of risky nuclear bluster. But it also includes a number of cases in which decision-makers stopped short of nuclear use because of constraints against first use. These constraints are known collectively as the “nuclear taboo,” an informal but widely-observed prohibition made up of moral, political, bureaucratic, military, practical, and diplomatic hurdles and inhibitions. This taboo has played an important role in preventing nuclear war. But even though it persists today, it may not be enough to prevent nuclear war in the future. Dismayed by the civilian casualties caused by atomic bombs in Japan and later by the incomprehensible destructiveness of hydrogen bombs, as demonstrated by US and Soviet thermonuclear tests, Truman had come to regard both as “weapons of last resort.” But his successor Dwight D. Eisenhower thought otherwise, believing that nuclear weapons could be used “just exactly as you would use a bullet or anything else,” as he said at a 1955 news conference. 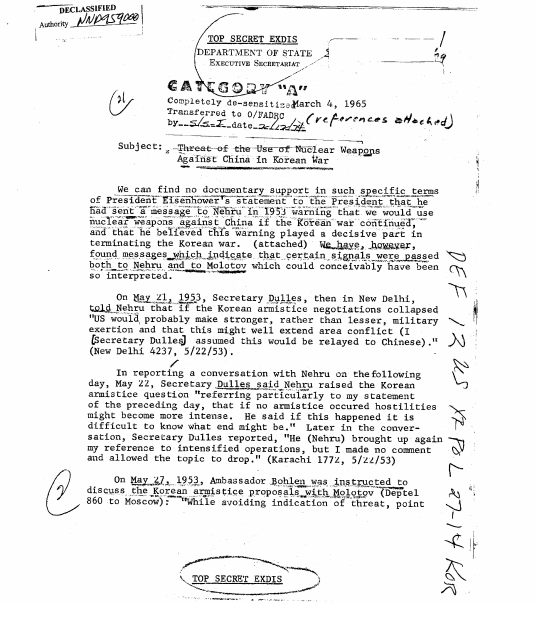 After the Korean War ended, Eisenhower and Secretary of State John Foster Dulles claimed they had secretly and successfully brought China to terms at the negotiating table by threatening to use nuclear weapons. In 1954, during the French War in Indochina, Eisenhower and Dulles considered using atomic bombs to break the Viet Minh siege at Dien Bien Phu. 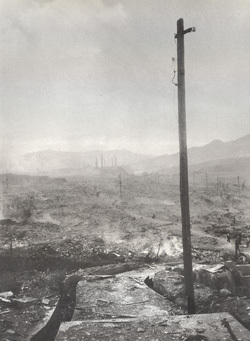 They also issued public nuclear threats and placed nuclear (as well as conventional) forces on high readiness during the Taiwan Strait crises of the 1950s. During the 1958 civil war in Lebanon between pro-Western Christians and Soviet-endorsed pan-Arab Muslims, Eisenhower put US nuclear forces on their largest and highest alert yet, with hundreds of strategic bombers readied for launch. Yet even as Soviet nuclear forces grew and as Eisenhower and Dulles became more aware of nuclear dangers, their thinking shifted. During the 1958 Taiwan Strait Crisis, Eisenhower kept tight control over nuclear weapons and conceded in a message to the British foreign secretary that when you use nuclear weapons “you cross a completely different line.” Eisenhower came to view these weapons as belonging in a special category—although he continued to profess support for their use in the event of a Soviet onslaught against Western Europe or an attack against US territory. 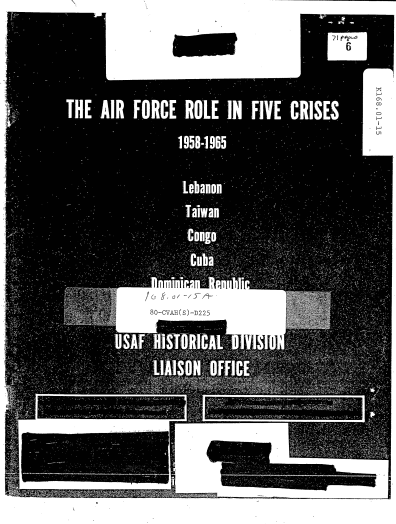 The doubts of civilian leaders notwithstanding, in the 1950s the US Air Force drafted war plans that included the preemptive use of nuclear weapons against Soviet bomber and missile bases if US intelligence agencies surmised that the Soviet Union was preparing a surprise attack on US military forces and cities. Preemption continued to be a central tenet in US planning during the Cold War and served as a key justification for increased spending on nuclear weapons. Secretary of Defense Robert McNamara, who served under Presidents John F. Kennedy and Lyndon B. Johnson, advised against first use of nuclear weapons, except in the instance of massive attacks on US forces abroad by China or the Soviet Union. Both presidents took heed of that advice, although Kennedy brought his country perilously close to the nuclear brink during the Cuban Missile Crisis, when US nuclear forces were at their highest state of alert ever. Luckily, both Kennedy and Soviet Leader Nikita Khrushchev avoided fatal mistakes despite the potential for danger inherent in anti-submarine maneuvers and secret Soviet nuclear deployments. When challenger Senator Barry Goldwater and others called for the use of nuclear weapons in Vietnam during the 1964 presidential campaign, President Johnson explicitly cited the language of taboo: “For 19 perilous years no nation has loosed the atom against another. To do so … would lead us down an uncertain path of blows and counterblows whose outcome none may know.” A CIA study about potential outcomes of nuclear use in Vietnam argued that it would cause a “fundamental revulsion that the US had broken the 20-year taboo on the use of nuclear weapons” and produce a “wave of fear and anger,” with allies condemning the United States for “having dragged the world into a new and terrible phase of history.” Such admonitions put a damper on any serious White House consideration of using nuclear weapons in Vietnam during Johnson’s tenure, although some advisers entertained the notion. The election of Richard M. Nixon to the presidency, however, brought to power a politician steeped in the Eisenhower-Dulles school of nuclear threat making, who believed that such threats had brought the Korean War to an end. 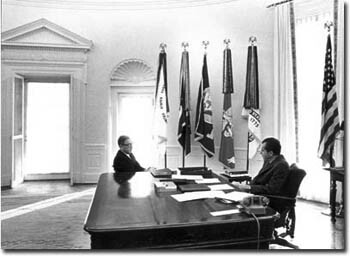 Nixon entered the White House in 1969, while the Vietnam War was raging. Like his national security adviser, Henry Kissinger, he believed that ending it was their top priority, in part because his re-election depended on it. He thought that the right combination of carrots (diplomatic inducements) and sticks (threats and stronger military measures) could make that possible. Drawing on his experience as vice president during the Eisenhower administration, Nixon had developed what he called the “madman theory,” which posited that threatening massive, even excessive, levels of military violence, including nuclear attacks, would intimidate the North Vietnamese and their patrons in the Soviet Union into submission at the negotiating table. During his first year in office he made secret madman threats against North Vietnam in hopes of bringing it into compliance by the end of 1969. He and Kissinger also hoped that such threats would make Soviet leaders worry that the war was going to spin out of control, thus encouraging them to put pressure on Hanoi to make the requisite concessions. In September 1969, Kissinger’s aides drew up a concept plan for military escalation against North Vietnam that included proposals to use nuclear weapons on two railroad lines to China and three mountain passes on the Laos-North Vietnam border. In early October, however, Nixon decided against escalation, in part because of his concerns about negative public reactions at home and abroad and worries about previously scheduled anti-Vietnam War demonstrations. He also faced opposition to escalation from within his own administration, including cautionary advice from some of Kissinger’s own aides. Moreover, madman threat-making had not moved Moscow to cooperate in putting pressure on Hanoi to yield in the Paris negotiations. 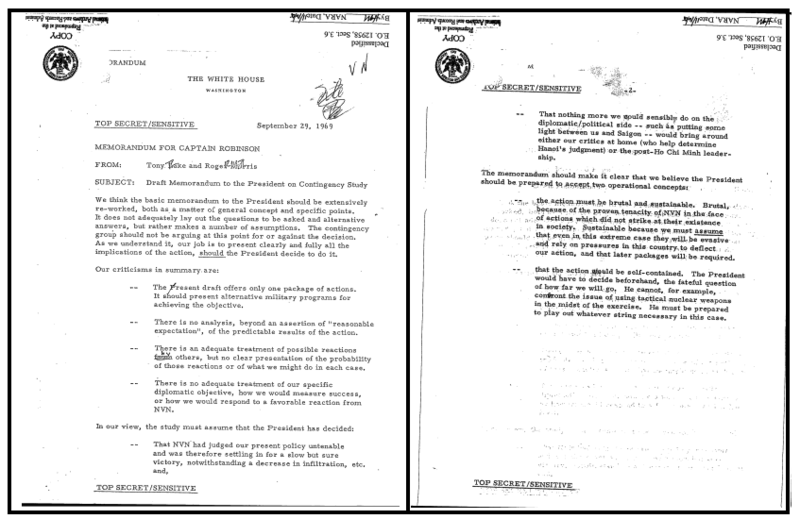 Memorandum from Tony Lake and Roger Morris, NSC Staff, to Captain [Rembrandt] Robinson, Subject: Draft Memorandum to the President on Contingency Study, 29 September 1969, Top Secret/Sensitive. Instead of escalating militarily, on October 9, 1969, Nixon and Kissinger instructed the Pentagon to place US nuclear and other military forces around the globe on alert, and to do so secretly. Angry that Moscow had not put pressure on Hanoi to back down but instead continued to provide North Vietnam with military aid, Nixon made a last-ditch gambit to get Soviet cooperation. For 18 days in October, the Pentagon orchestrated one of the largest and most extensive secret military operations in US history. Tactical and strategic bomber forces went on alert, as did Polaris missile-launching submarines (intercontinental ballistic missiles were already on high alert routinely). Aircraft carriers made unusual movements in the North Atlantic and Sea of Japan, while destroyers shadowed Soviet merchant ships heading toward North Vietnam. This “Joint Chiefs Readiness Test,” as it was called, officially culminated in a flight of nuclear-armed B-52 bombers over northern Alaska, the first time that the Strategic Air Command had undertaken nuclear overflights since a major accident in Greenland in early 1968. The secret US nuclear alert, though certainly noticed by Soviet leaders, failed to pressure them into helping Nixon win concessions from Hanoi. Instead, Nixon shifted his Vietnam War strategy to a “long route” approach that emphasized unilateral US troop withdrawals, the training and enlargement of South Vietnamese forces, and protracted negotiations designed to achieve a compromise settlement by the time of the 1972 presidential election in the United States. His anger notwithstanding, Nixon never took this idea any further, although he brought it up on several other occasions before and after. One of Kissinger’s responses in the Executive Office Building conversation suggested what the constraints were: nuclear use would be “too much,” as if crossing a line, which would elicit condemnation around the world and provoke Soviet and Chinese responses. Nixon faced the same checks previous presidents had. 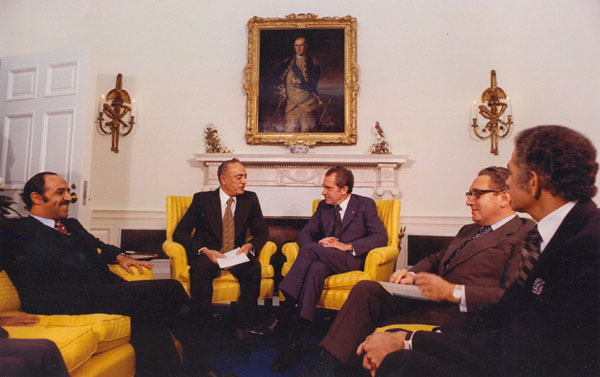 Nixon and Kissinger Meet with Four Arab Foreign Ministers, 17 October 1973: Ahmed Taiba Behima (Morocco), Sabah al-Ahmad al-Jabir al-Sabah (Kuwait), Omar Saqqaf (Saudi Arabia), and Abdelaziz Bouteflika (Algeria). Saqqaf is Nixon’s right. The other two ministers have not been identified, while one of the four was not included in this photo. The DEFCON 3 in 1973 was the last US nuclear alert of the Cold War. The Soviets did not respond with their own readiness measures, but they were angry and irritated. Kissinger, however, came to recognize that threat diplomacy was becoming too dangerous and too incredible to be taken seriously by an adversary. As he explained after he left office, the United States could not “afford to repeat the rapid escalation gambit.” Nevertheless, dangerous launch-on-warning and preemptive options remained basic elements in US nuclear planning. Although subsequent US presidents tacitly ruled out nuclear alerts in the last years of the Cold War, tensions with the Soviet Union often remained high, generating episodes that had the potential to spin out of control. 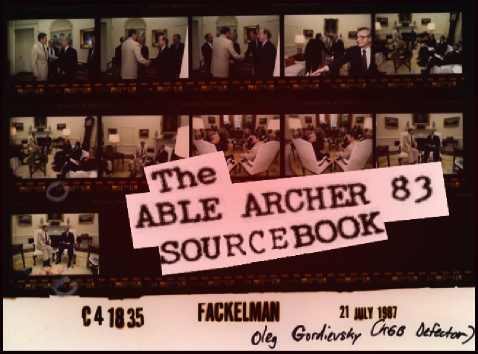 The Soviet reaction to the NATO military exercise of November 1983, code-named Able Archer, was particularly noteworthy. The Soviets interpreted NATO’s practice nuclear-weapons release procedures as a portent of actual nuclear-weapons use. Worried about the possibility of a US strike, Moscow readied its nuclear forces. Ultimately, cooler heads prevailed, but November 1983 was an especially tense period in Cold War history. Bellicose talk by President Ronald Reagan and officials in his administration in the months preceding Able Archer about fighting and winning a nuclear war with the Soviet Union had set the stage for the November scare. The language of nuclear threat-making continued to pepper discussions about foreign policy, especially during the lead-up to the 2003 US invasion of Iraq and in debates over the Iranian nuclear program. In early 2002, President George W. Bush set the tone when he declared that “all options are on the table” to counter threats by other states who would use “weapons of mass destruction” against the United States. Responding to reporters’ questions three years later in Brussels about US policy toward Iran’s nuclear program, President Bush responded with what many regarded as a typical Bushism: “This notion that the United States is getting ready to attack Iran is simply ridiculous. And having said that, all options are on the table.” He was not alone. Leading Democrats, including then-senators Hillary Clinton, John Edwards, and Barack Obama, used similar language. As a presidential candidate and as president, however, Obama promised to reduce the role and number of nuclear weapons in the US arsenal. He called for “the peace and security of a world without nuclear weapons,” reiterating official US policy—though more as a worthy, long-term goal best pursued incrementally than as an immediate objective. Obama also declared that the United States would remain nuclear-armed as long as other countries possessed stockpiles. According to statements he made in 2010, though, nuclear options would be a “last resort” and would not be available against non-nuclear states that were in compliance with nuclear nonproliferation norms. Nuclear powers continue to make nuclear threats. Recently, Russian officials and Pakistan have said they would use their weapons if they deemed it necessary. At the same time, the United States appears to be entering a period of expanded nuclear budgets, in part because a critical mass of Pentagon planners still embrace outdated Cold War nuclear strategies, including that of first strike, in which the goal is to preemptively attack the opposing nation’s arsenal in order to diminish or destroy its ability to retaliate. The Congressional Budget Office estimates that the United States is planning to spend $348 billion to maintain and modernize its nuclear arsenal over the next 10 years—an amount so great that it would establish (or strengthen) strong vested interests against abolition or even meaningful reduction. With prospects for US and Russian nuclear arms reductions at a standstill, the White House has not yet sought to rein in these exorbitant spending plans. Citing nuclear competition with China and Russia, which are both modernizing their nuclear forces, the Pentagon justifies its budget goals with language and scenarios straight out of the Cold War. Joint Chiefs of Staff Vice Chairman James Winnefeld Jr.recently said to the House Armed Services Committee that Russian plans for mobile, land-based ICBMs worried him because they “would be hard for us to hit in a first strike.” This statement is cause for concern because it shows that the Joint Chiefs of Staff believes there might come a time when the United States would want to launch a first strike. Seventy years after the destruction of Hiroshima and Nagasaki, nuclear weapons remain in a special category, in which their use is narrowly circumscribed. They have become unusable except in the most unlikely circumstances, and their value as a deterrent lacks credibility because of the catastrophic dangers of mass and mutual destruction. US presidents since Truman have come to realize that nuclear war is unwinnable. Nonetheless, they have built up and to this day maintain forces that far exceed any calculation of what it requires to deter a nuclear attack. Today, the United States still has about 2,080 deployed nuclear warheads and Russia has some 1,780. Many of these weapons are primed for prompt launch and can reach their targets within 25 minutes. If these weapons were used even in a “limited” way, the result would be catastrophic nuclear devastation. This suggests that while the nuclear taboo still exists, the non-use legacy is at risk as long as defense officials in Russia and the United States continue to think and act in irresponsible Cold War terms, and the US Senate refuses to ratify international restrictions on nuclear testing. As powerful a restraint as the taboo has been and may still be, complacency is foolhardy. Editor’s note: The opinions expressed here do not represent those of the National Security Archive. May we never ever forget….